I LOOOOOVVVVVEEEE fall! I mean - LOVE it! In Texas we sometimes get cool weather and I am hopeful for that this year considering all the cool-ish weather we've had this summer. My fave part of fall has to be the Starbucks Pumpkin Spice Latte'! And did you know - that they obviously love me and think I'm awesome because they decided to bring it back TODAY in honor of my birthday TOMORROW! I mean - they just wanted me to be able to celebrate my 28th year with a yummy extra caffinated and super sweet beverage! 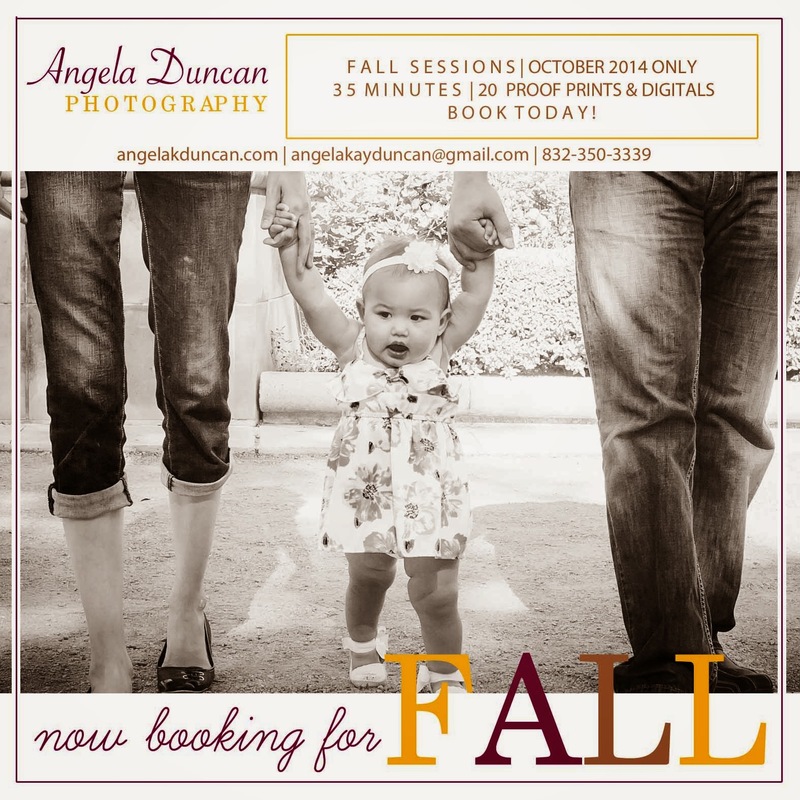 So - this fall, instead of setting aside one or two days and do back-to-back-mini sessions, I've decided to dedicate the ENTIRE month of October to those of you who want to get those Fall/Holiday photos out of the way. I do get asked all the time - "Angela, what do I wear? What should we dress in?" Answer: NOT jeans and matching t-shirts. Wear colors that accent each other and won't clash when put next to each other. 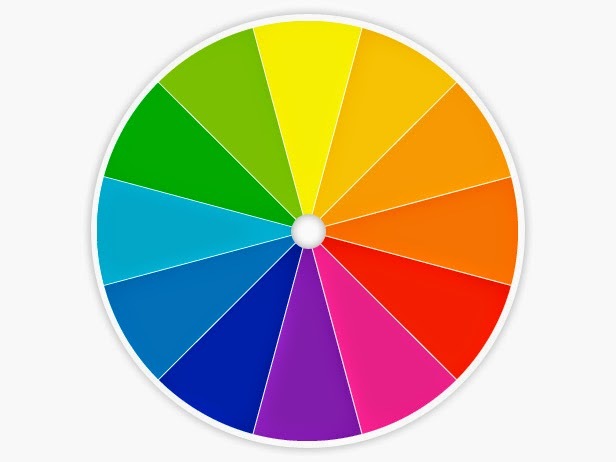 When in doubt, ALWAYS go to the color wheel. For fall, I usually suggest those colors on the right side of the wheel. When you choose your main color - go directly opposite to determine what other colors will work well with it! Orange, tan, and browns are great to use as your main "scheme" and accent with navy blue sweaters, jeans and boots. It's usually best to put ladies in a lighter color top and guys in something darker. However, if you're like me and a little self-conscious of your waist line, opt for a darker color top. This is probably one of the areas that I sometimes forget to mention when people book their sessions. I'm a girl you'll see running around town in a t-shirt and yoga pants with my hair up in a mom bun - you'd never guess that I have drawers full of jewelry and a closet full of belts, scarves and shoes. When you are getting your photo taken - it's sooo important to accessorize! Did you know that big/long earrings make every face look longer and thinner? Chunky or long necklaces can give the illusion of a smaller waist line? And think about it - jewelry draws attention to the thinnest parts of your body - ears, neck and wrists! The same goes for scarves! You might be thinking - what about the guys? Guys can add texture to their look by layering a sweater over a polo or button up over a colored t-shirt. Dress shoes, belts, watches and ties, also add a lot of interest. The biggest thing is to be comfortable. I suggest usually wearing something you already own and like, but if you feel like you want something new for your session, make sure it's something you will wear again. Too many times, I've had clients say that they wish they wouldn't have bought that shirt/dress/etc because it looked great in the store and now they never want to wear it again. Be very careful to make sure that you like your outfit before you leave the house.